How much caffeine should I have a day? What is a lethal dose of caffeine? This caffeine calculator finds out how much caffeine you had during a day. Thanks to this tool, you will be able to quickly assess if you should stop drinking coffee or you can drink one more cup to regain your energy. In this article, we will tell you what is a lethal dose of caffeine and how much caffeine you should have a day. Keep reading to find out, or head to our blood alcohol calculator if you are interested in a similar tool for alcohol. You can use our calculator to determine the total intake of caffeine from three different sources. First, choose a caffeine source - for example, cups of tea or espresso shots. Then, enter how many of these you had during the day. Repeat the first two steps for every caffeine source. 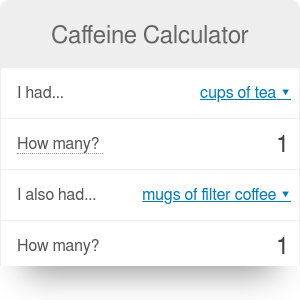 The caffeine calculator will automatically find your total caffeine intake. The maximum amount of caffeine depends on your age, gender, and health condition. For example, if you often have a high blood pressure, you should consult your doctor for a recommended daily caffeine intake. Adults: the maximum daily dose shouldn't exceed 400 mg. It is equivalent to three large mugs of filter coffee - if you drink more than that, it can have a negative influence on your health. Teenagers (aged 13-18): as the teenagers' bodies are still developing, they should limit their caffeine intake to about 100 mg a day. It corresponds to one large mug of coffee or two shots of espresso. Children (below 13): small children should avoid caffeine in general. It is not advisable to provide them with substantial amounts of coffee. Pregnant women: the maximum recommended caffeine limit in case of pregnancy is 200 mg per day. Don't worry if you will discover that your daily caffeine intake exceeds the recommended value. It is extremely unlikely that one or two additional cups of coffee will cause a stroke or another serious health condition. It is assumed that the lethal dose of caffeine is about 10 grams. This corresponds to about 70 mugs of coffee, 125 energy drinks or 200 cups of tea. While it is almost impossible to reach that dose with traditional caffeine sources, you should make sure that you keep your caffeine intake at a reasonable level. Caffeine Calculator can be embedded on your website to enrich the content you wrote and make it easier for your visitors to understand your message.